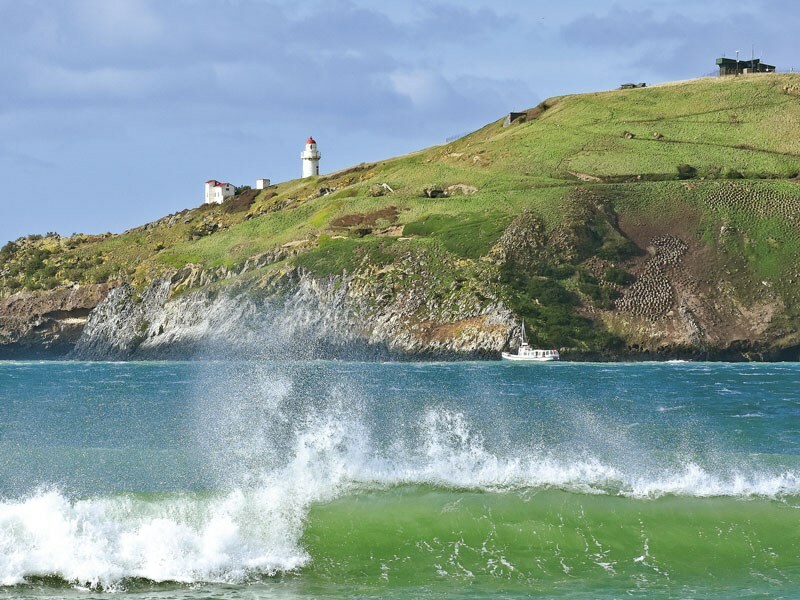 Lucky Dunedin; it has glorious Otago Peninsula on its doorstep to use as its playground. The Peninsula is a steep, hilly finger of land 20km-long and a few kilometres wide that make the southern and eastern side of Otago Harbour. The Peninsula and the harbour were formed by long extinct volcanoes. A couple of classically pointed hills attest to that. Portobello Road curls around the edge of the harbour, and we were being driven along it in a Elm Wildlife Tours' minibus. Wildlife near Dunedin? Well, yes, and it is special. It is our indigenous New Zealand wildlife. Yellow-eyed penguins are completely endearing in an ungainly way. They are sleek and swift, swimming in the waves, but when they come ashore, their elegance turns into waddling clumsiness as if they are drunk and trying not to stumble. They don't dally on the beach. There were two sea lions further along who might have enjoyed a penguin snack. When the penguins were a little way up the hill and out of danger, they stopped to rest, preen their feathers, and survey the landscape before moving on to their next climb. We were in a hide and other penguins nested nearby. They ignored us. They don't fear humans, and it is a privilege to be close enough to admire them. Yellow-eyed penguins are endangered. Sadly, fewer than 3000 nest on mainland South Island and a couple of hundred choose Otago Peninsula. Elm Wildlife Tours has tours to two adjoining farms to see some of New Zealand's unique wildlife. Yellow-eyed penguins, little blue penguins, sea lions, and fur seals are all within easy walking distance. Elm organises predators management. Weasels, stoats, rats, and wild cats can all prey upon penguin eggs and chicks. Last year, the predator trapping programme was so successful that of the 19 penguin chicks hatched, only one disappeared before they fledged. This year, 15 of these have returned home from sea, fat and happy. to see them peering out of their nesting boxes. Although they are out-glammed by bigger, prettier, yellow-eyed ones, they benefit from predator trapping and nest nearby. There were four sea lions on the beach, all males, dozing, cuddled up in pairs for company and warmth. 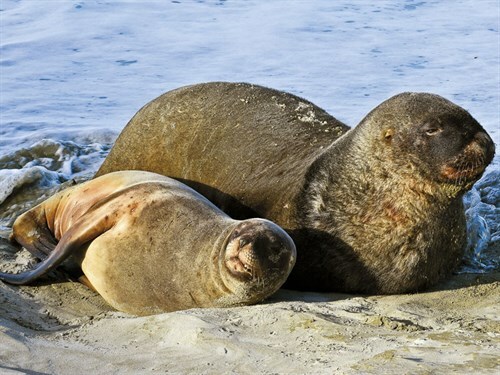 There are 160 male sea lions living on the New Zealand mainland and 20 breeding females. The females stay well away from the blokes and keep their pups hidden. Too much attention from lumbering, randy sea lions isn't fun for a mum or a young pup. We walked over a ridge and down a windswept path to view the fur seal colony. Again, big males are not welcome here. The cubs are no longer babies but are too young to leave the protection of the colony. Mothers loll about and keep half an eye on the young ones who play; they have swimming races in rock pools. They are cute with their big brown eyes with dark eyeliner, little down-facing ears, black pointed noses and whiskers. Pukekura, the Royal Albatross Centre, at Taiaroa Head on the tip of Otago Peninsula can be visited as part of the Elm Wildlife Tour or separately. 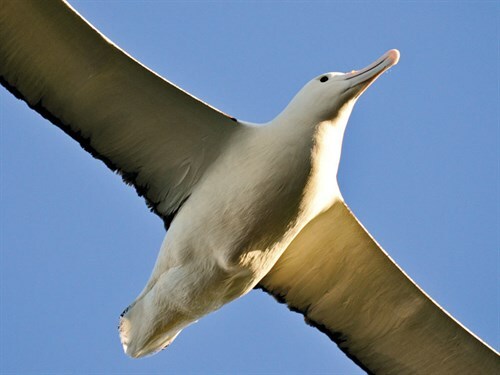 There are 24 species of albatross and the royal albatross. The species that nests at Pukekura is the world's largest bird, weighing eight kilogrammes or more, with a three-metre wing span. Since the first albatross egg was laid at Pukekura in 1920, the colony has slowly grown to 30 nesting pairs with more juveniles returning every year as adults ready to mate. This is the only place on the mainland where these majestic birds nest. Royal Albatrosses are endangered with some 20,000 pairs in the world. Most nest on Chatham and other Southern Ocean islands. I've long been fascinated by albatrosses. They are poetic and enigmatic, flying around the Southern Ocean alone for most of the year and then returning to their nesting site in September to reacquaint with their mate. They meet and after an elaborate courtship with lots of squawking, cackling, and cracking of beaks, they re-establish their relationship. Sam and I had been following the progress of Moana, a movie-star chick who had her nest and early life filmed by a webcam and portions of it turned into YouTube clips (royal-cam). It is thrilling to see her from a hide on top of Taiaroa Heads, stretching her wings, and practising taking-off and landing. She is wobbly as she takes off into the wind and spreads her feet wide, like a duck, hovering briefly, then landing in an ungainly tumble. Two days after we watch her, Moana got it together, and in a stiff south-westerly, launched herself into the world. 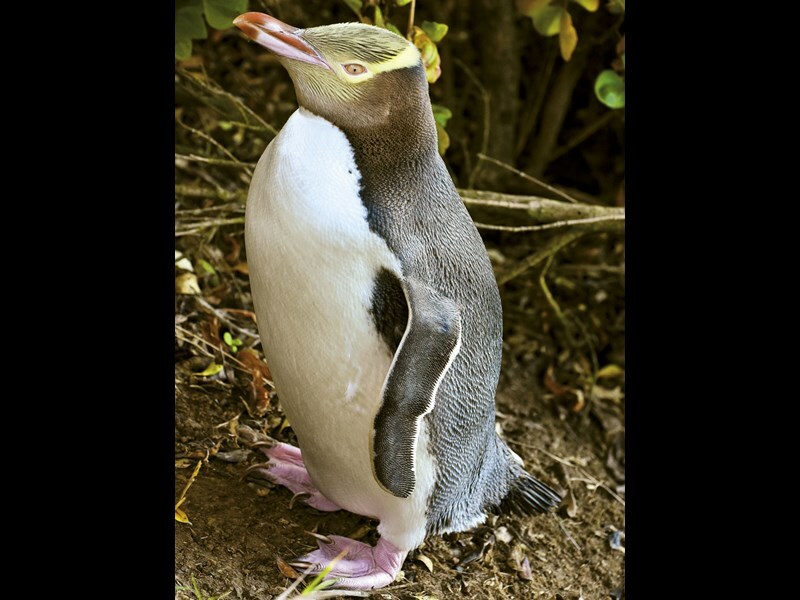 She will stay away, fishing and flying alone at sea before she returns to Taiaroa Heads in about six years to mate. Eighty percent of the fledglings return. The rest are lost, probably through fishing. Please, let Moana be one of the lucky ones. Otago Peninsula is a primo destination because some of New Zealand's unique and rare wildlife is easy to see but it has much more to offer. Maori settled here in the 1300s and it was, at times, quite intensely populated. Our illustrious Captain Cook touched down in 1770, and in 1808, the first sealers arrived. Back then, there were many more seals than there are now—easy hunting for oil and future fur coats. In 1826, the first New Zealand Company settlers arrived and by 1848 there were 12,000 Scots in nearby Dunedin. In the 1860s, Dunedin prospered, reaping the benefits of the Otago gold rushes and briefly became New Zealand's largest town. Many of the city's stately buildings date from this time and the wealthy bankers and merchants used the Peninsula as their playground. The historic Larnach Castle, former home of William Larnach, is one of the main attractions in Dunedin. William, of Scots descent, began his banking career in the Australian gold fields. When the gold rush in Otago was well established in 1867, he was appointed the manager of Dunedin's Bank of Otago. He was already rich but soon got richer, and by 1877 he was wealthy enough to build a castle, high on the peninsula. William married three times and had six children. His third wife, much younger than him, was rumoured to have had a romantic liaison with his eldest son. William, who by this time was a parliamentarian, shot himself in the Parliament Buildings. The castle subsequently had many owners and uses—as a lunatic asylum, a hospital for shell-shocked soldiers, and a nuns' retreat. The ballroom was once used as a sheep barn. 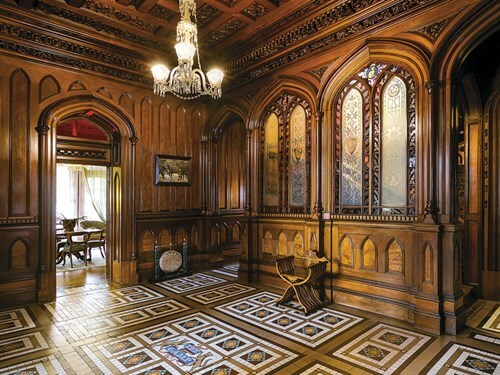 In 1967, it was bought by Barry and Margaret Barker, who while touring the peninsula on a belated honeymoon, saw the castle and fell in love with it. It was virtually a ruin and the Barker's friends and family thought they were crazy to consider such huge restoration project. But they stuck with it. Now, 50 years later, each room is appropriately restored and the garden, all 14 hectares, is more beautiful than it was during William's time. It's an icon of the Peninsula and well worth a visit. 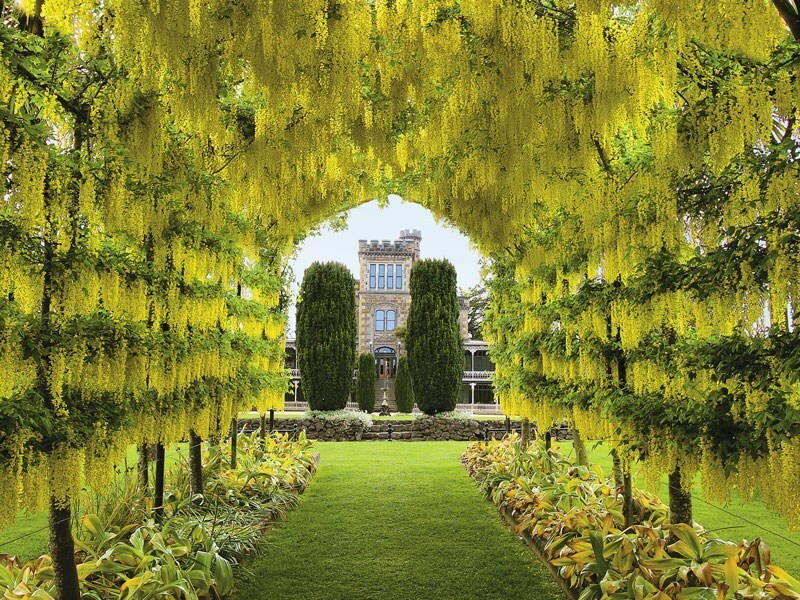 When the hill-top Larnach Castle is buffeted by winds or surrounded by swirling clouds, Glenfalloch Gardens, in sheltered MacAndrew Bay, is serene, snug, and florally fragrant. George Russell, a merchant and contemporary of William, did not have his deep pockets or extravagant taste but his country residence, Glenfalloch, is substantial and charming. The woodland garden surrounding the stately home contains 140 years of botanical heritage with each season bringing its own blooms, colours, and fragrances. 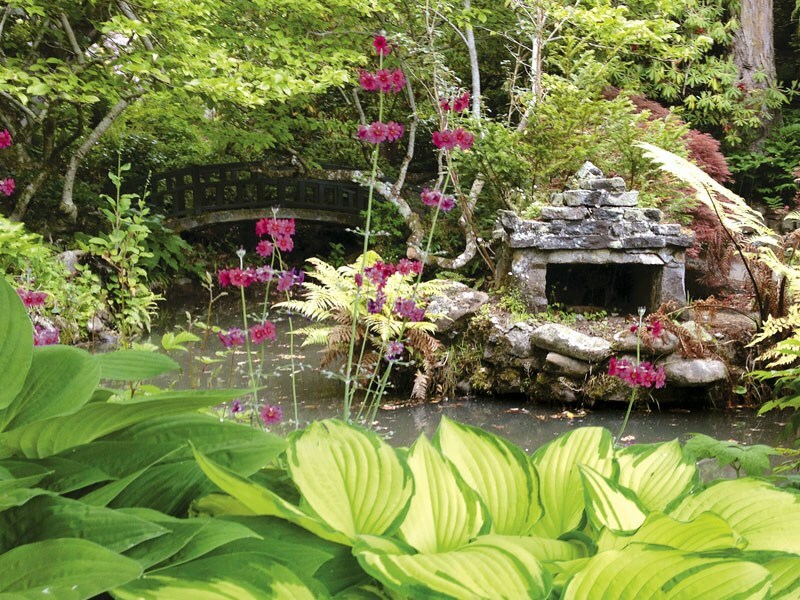 Exotic trees and flowers, many sweetly old-fashioned, fill the valley alongside a stream and ponds. It's simply pretty. And there is a cafe here, too. There are two great drives on the Peninsula. Portobello Road curls along the harbour's edge to Portobello village and eventually ends at Taiaroa Head. Back in the day, prisoners were put to work, making this road, hewing it from the cliff, and shoring it up from the sea with carefully laid stone walls. The views across the harbour are a delight and there are interesting stops along the way. The spectacular views from both side of the Highcliff Road, navigating its way along the ridge, makes for an extraordinary drive. To the south and east, isolated and lonely beaches are sickles of honey-coloured sand, trimmed with white surf and separated by rugged green headlands. Two inlets add to the visual and geographical interest. On the north and west side of the ridge, long slender Otago Harbour reveals its beauty with Dunedin at the west end, past islands and pretty Port Chalmers, basking in the sun. 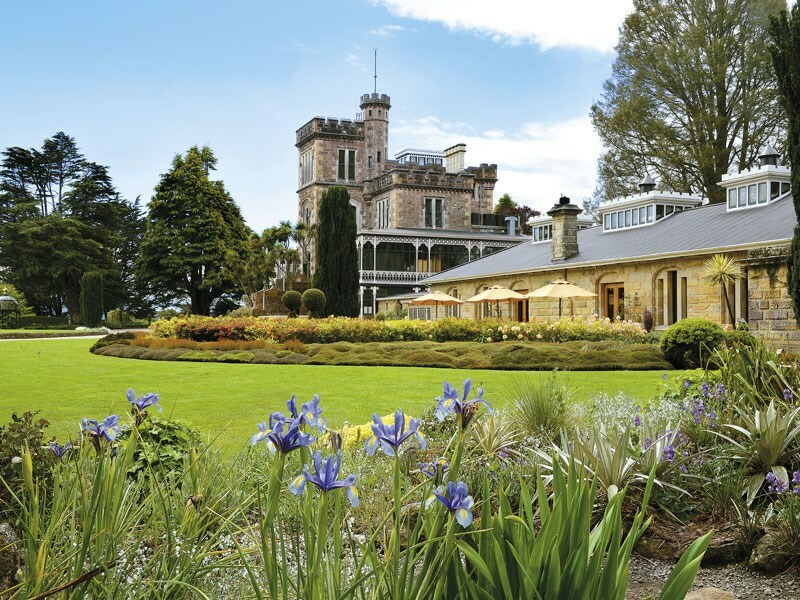 The peninsula ticks all the boxes. It has cute villages, glorious gardens, mansions, beautiful beaches, great drives, and terrific walks. And there is the wildlife—penguins, albatrosses, fur seals, sea lions, and much more. It is extraordinary that a relatively small area of land has so much to offer.